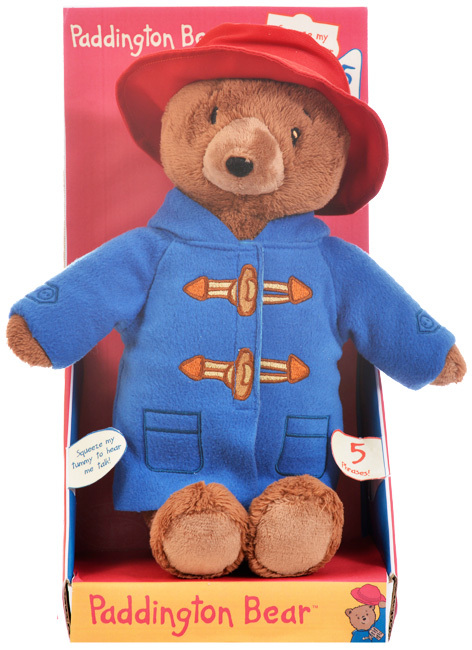 The Talking Paddington Bear is made from super soft plush and is wearing a removable blue duffle coat and red hat. Press Paddington's tummy to hear one of his 5 famous phrases – “Hello My Name is Paddington", "I’m a very rare sort of Bear", "Marmalade Sandwiches are my favourite", “It’s nice being a Bear especially a Bear called Paddington”, “Good Afternoon I’m from darkest Peru”. The 30 cm Talking Plush Paddington is suitable from birth. The Talking Paddington is part of Rainbow Designs' Paddington toy collection that launched in September 2014 and includes: Paddington Bear bean toys, Paddington Bear soft toys, Talking Paddington Bear, Paddington 4 in 1 puzzle with stickers, Paddington’s Tea Party 48 piece puzzle, Paddington wooden dominoes and a Paddington Bear mix and match card game. Please tell us what you think of the Talking Paddington Bear by Rainbow Designs.